The Chargers’ ability to shut down Peterson in the second half had as much to do with predictable playcalling as with a failure of the offensive line to block effectively for him. The pass protection was messed up, however. Donovan McNabb was under pressure all game long. His first official pass as a Viking went for an interception in part because Charlie Johnson didn’t cut block his guy, Shaun Phillips. McNabb had that pass batted down during the preseason too, so he’s got work on not throwing it so low, but Johnson’s failure to block would prove foreshadowing for his performance during the rest of the game. McNabb never really had much time to look downfield in the passing game due to pressure that the Vikings line failed to defend. Twice McNabb took off on impressive runs when there was no one to pass to, converting first downs. Johnson wasn’t the only offensive lineman to have a shaky performance. Phil Loadholt‘s failure to contain his guy in the fourth quarter likely took a touchdown off the board for the Vikings. Loadholt’s guy hit McNabb as he was releasing his deep pass to Bernard Berrian, causing an underthrow. Berrian had two steps on his guy and had McNabb been able to lead him, he almost certainly would’ve scored. As it was, Berrian had to come back and fight for the undethrown ball and we know that ain’t his thang. It’s way too early to freak out. Given all the chaos of the offseason and given all the new and moving parts of new players, new coaches, new offense, it will take time for the offensive line to come together as a unit. Remember the Bears offensive line last year? It was such a mess early in the year, people were calling for Mike Tice‘s head but by the end of the year, the line was very good indeed. It takes time. While it’s nice to see Berrian is still capable of getting behind defenders, that pass would’ve been an easy catch for Sidney Rice. The only other pass throw Berrian’s way was a comeback route that he failed to hang onto with a defender on his back. And that, in a nutshell, might be Berrian’s major problem. Brett Favre clearly didn’t trust Berrian and the only reason a quarterback doesn’t trust a receiver is he doesn’t believe his receiver is capable of making the play in question. It’s early and we’ve got a new quarterback, I know, but might McNabb discover that with a defender near, Berrian is unlikely to make the play? Will that cause him to just not consider throwing to Berrian if he’s covered fairly closely? Will that leave Berrian with only one role, stretching the field on the go route? Can Berrian be effective having only one role? McNabb obviously is comfortable with Michael Jenkins, whom he targeted for his first touchdown pass as a Viking and hit several other times, most impressively on a back shoulder early in the game while facing pressure because Charlie Johnson’s guy blew by him. Despite the poor pass protection, McNabb still played an awful game. 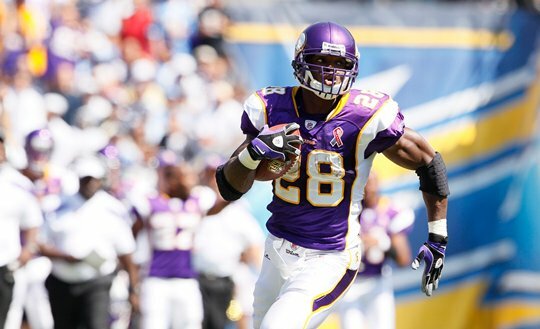 Peterson, as great as he looks, still made a few questionable choices when carrying the ball, running into traffic when there was an open lane to run through elsewhere. And he’s still got to work on his pass protection and recognizing who to pick up. I’ll talk defense and special teams tomorrow.